A report to the UN Human Rights Council on Israel's shelling of Beit Hanoun in Gaza almost two years ago says it may have been a war crime. The report compiled by Archbishop Desmond Tutu casts doubt on Israel's explanation that the shelling resulted from a flawed artillery firing system. 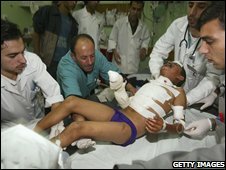 It calls on Israel to pay compensation to the victims, 19 of whom were killed. Archbishop Tutu went to Beit Hanoun in May, after objections by Israel delayed his mission several times. The BBC's Imogen Foulkes in Geneva says the South African cleric's report contains horrific testimony from survivors of the shelling. She says it speaks of the dead lying in the streets, of local hospitals overwhelmed, and of the injured having to hand over cash to get through Israeli checkpoints for treatment in Israel itself. The Israeli military, which was at the time trying to prevent rocket attacks by Palestinian militants, says its own inquiry shows the shelling of Beit Hanoun was caused by technical errors, but Archbishop Tutu's report is sceptical. Mr Tutu says there is evidence of a disproportionate and reckless disregard for Palestinian civilian life, contrary to international humanitarian law, which raises concerns that a war crime may have been committed. "In the absence of a well-founded explanation from the Israeli military - who is in sole possession of the relevant facts - the mission must conclude that there is a possibility that the shelling of Beit Hanoun constituted a war crime," his report to the UN Human Rights Council said. The report calls for an independent investigation into the shelling. Archbishop Tutu will present his report to the UN human rights council on Thursday - during that debate Israel will have a chance to respond. The council is dominated by Muslim and African nations and Israel says it ignores most human rights abuses to focus on its conduct. "It is regrettable that this mission took place at all," Israeli ambassador in Geneva Aharon Leshno-Yaar told the Associated Press news agency.